This is one of many sets from Strelets depicting Civil War troops moving forward to the attack. It follows the same basic formula, which is a sprue’s worth of poses all very similar but subtly different, plus an extra sprue of command and more unusual poses. Here the basic pose is of a man advancing with musket lowered, sometimes running, sometimes walking, sometimes, well, something else. The basic pose is fine, but some of the ways it has been done here don’t look right. Several have an entirely straight leg plus the other bent and in front of the first (first and second rows), which is not a convincing pose to our eye. There is also a pose of a man holding his musket across his chest, which is fine but naturally stands out from the rest here. The two single-copy poses in the third row, including the flag-bearer, are pretty good and certainly credible, but the first man in the fourth row is not. He is very flat, and is presumably meant to have been hit, although exactly how that would cause this very odd position we struggle to imagine. The man next to him is falling forward, and given he is a single piece the pose has been well done. The third man in the row is lying on the ground, and would have been a very common site on any battlefield once the shooting began, and the fourth is a less convincing casualty lying on his stomach. Given the large number of casualties in the Civil War, and in all wars, such figures as these are necessary and add to both the drama and the realism of a scene. The men are all dressed in the same manner as the other Union infantry sets, which is to say largely correctly but without giving a balanced picture. All wear the dress frock coat with standing collar, which was often worn in battle, but no one wears the even more popular sack coat, nor any other item. The fatigue caps all these men wear are typical however, and a few have a blanket or coat rolled across their body. Kit is also correct in that every item is correctly done, though we were surprised that quite a few are missing their haversack, and some have the water bottle on the right hip, where it might interfere with access to the cartridge pouch. All the muskets are of typical design, and as you might expect of troops advancing, all have their bayonet attached. Many are quite short and not at all fearsome, and many of the scabbards are similarly truncated. 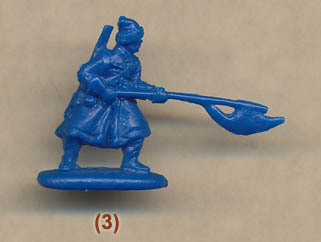 Only the flag-bearer in this set is armed with a sword. The sculpting is pretty good, and nicely proportioned, though not with quite the sharp detail of the best. There is virtually no excess plastic, and no flash, thanks to the chosen poses. The one compromise is with the first figure in the fourth row. You can’t tell from our image, but he has a drum attached to his left leg, although this naturally is significantly cut back since it is not a separate piece. As in the other sets, the flag is too small for a standard battle flag. It is better than some though, being 18mm tall and 20mm wide. This scales up to 130cm tall and 144cm wide, which is smaller than the regulation 180cm by 200cm, but does not look too bad, and is also clearly damaged, which goes part way to explaining a lack of width at least. However nothing can mitigate the short staff, which as 32mm is only half what it should be. This is partly down to the lack of a finial, which should be a spear point or eagle. The little accuracy issues don’t really disfigure these models, and although a few of the poses are not great, most are perfectly reasonable. As always the ‘extras’ provide some interesting and unusual possibilities - surely this is the first drummer who is being hit - and go a long way to break up what could have been a fairly monotonous set. We think this will be a very useful addition to the many Civil War sets already available, and while we would have done things differently if we had been in charge (as always), there is plenty here and in the sister sets to create a quite varied infantry assault scene.